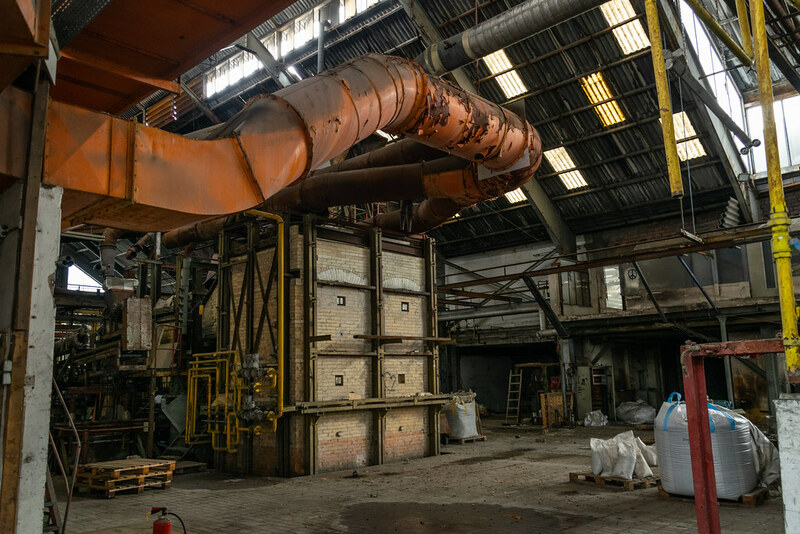 This time we’re exploring a massive abandoned glassworks somewhere in Germany. 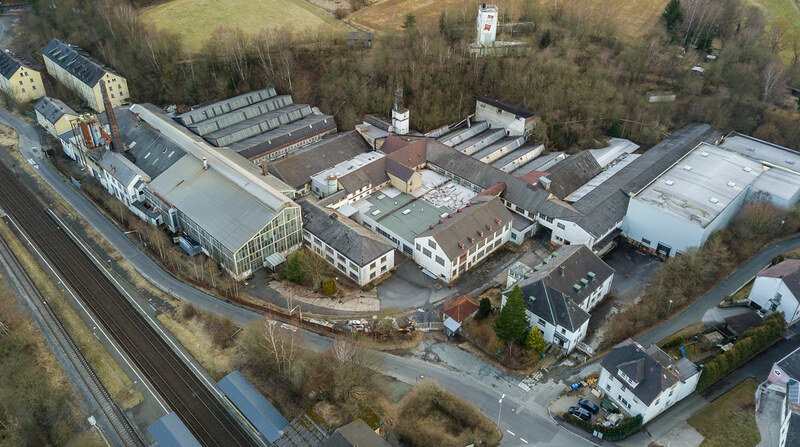 For nearly 150 years glass has been produced at this location. And still today you can find huge machines that were simply left behind. During our exploration we discovered glass in all imaginable forms and colors. We couldn’t believe that nobody is interested in this anymore! In the former industrialist's villa right next to the spacious halls we even found fully furnished offices and it looked like employees of this traditional business would just do one of their breaks and come back any second. Stay tuned if you want to know the story that’s hidden behind these forgotten walls. 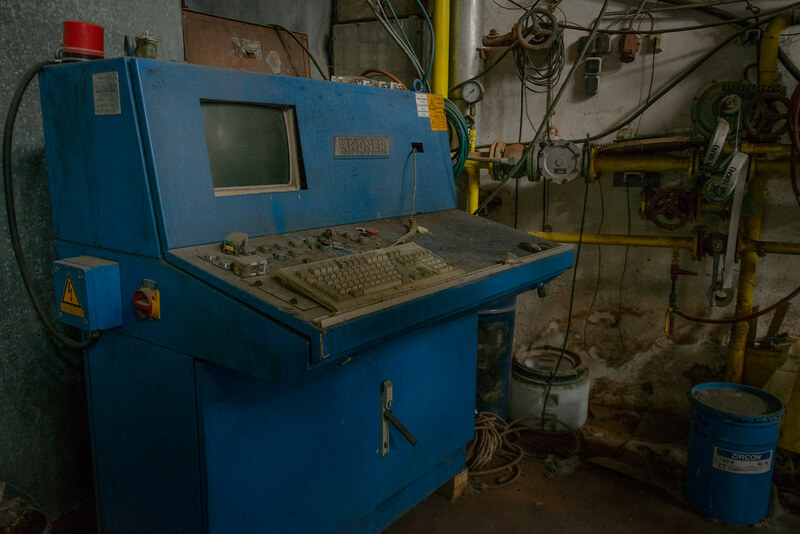 In the main hall of this enterprise there are still all the machines left behind which were used to produce glass back then. We didn’t expect to find this. The place is overwhelming! 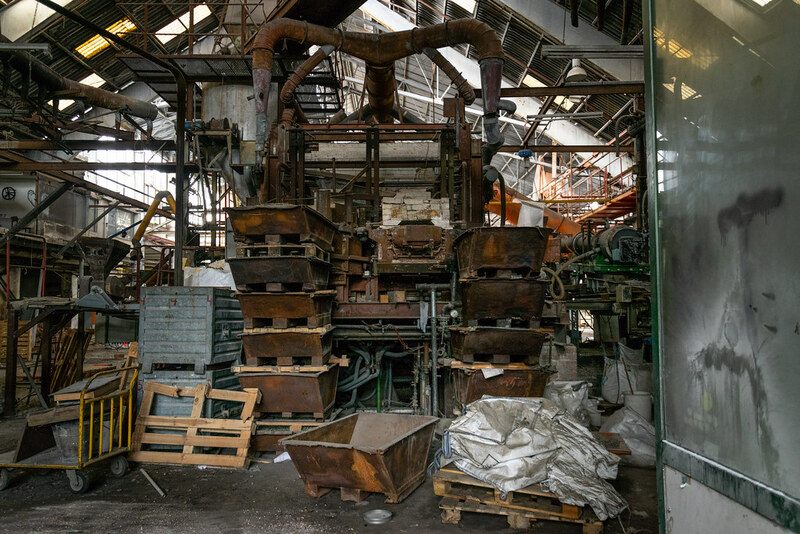 This factory nearly seems to be totally untouched. There are only a few spots with graffiti but luckily most parts of the hall were spared vandals. 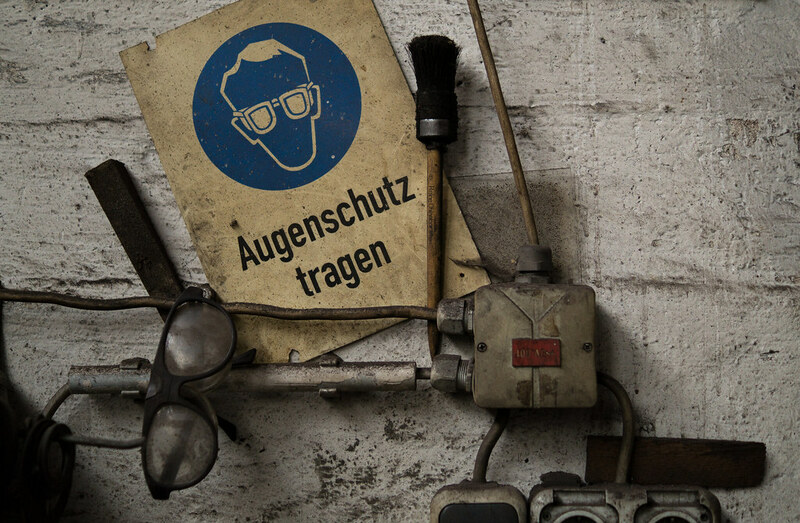 However, you shouldn’t explore this factory without suitable protection. In the past they were working here with toxic substances like lead for example. Today most parts of the area are contaminated. To be on the safe side, we were cleaning our whole equipment thoroughly after the exploration. Shoes, bags, cameras – we didn’t want to take any risks. 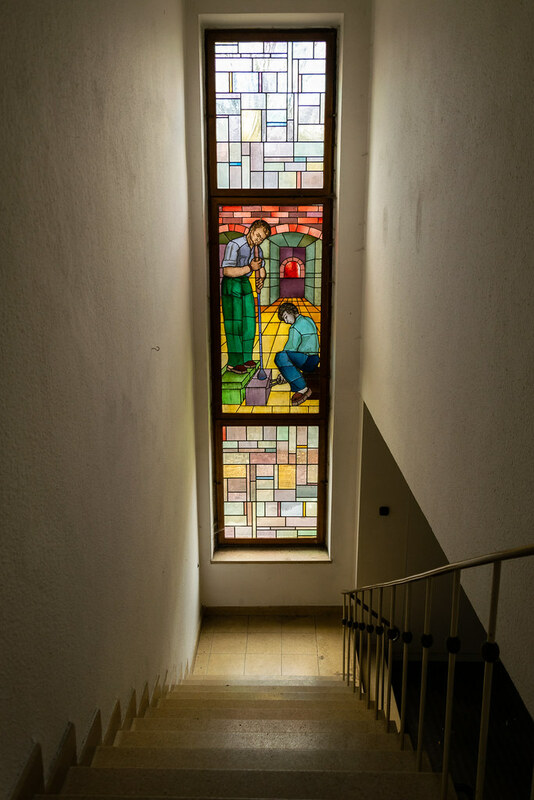 The glass craftsmanship has a long tradition in the region. Usually companies were founded where required raw materials were cheap and available in great numbers. That’s why a glassworks was built here around 150 years ago. At this point this was probably the largest facility of its type in the area. But in the next century it was already shut down. Until it was taken on and reconstructed by an entrepreneur in the 1930s. Now the glass foundry could continue operation. But during the time of World War Two especially the focus on production essential for the war effort kept the employees busy. The glass production didn’t continue until the post-war period. Crystal glass and leaded crystal were manufactured here in a laborious process. 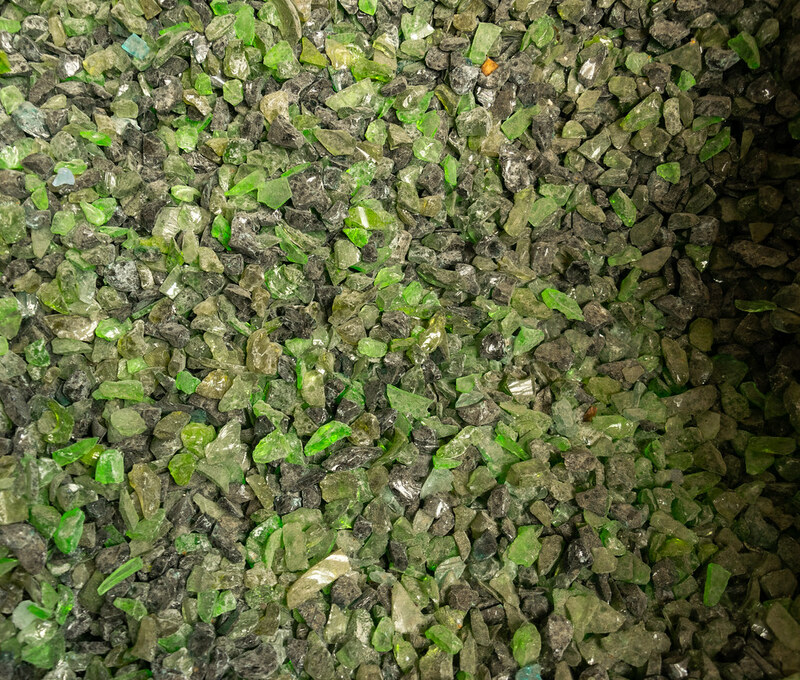 At first the raw materials like sand needed to be fused at extremely hot temperatures and then brought into shape. After that the pieces were polished and decorated lavishly. Several hundred employees were working here at peak times. 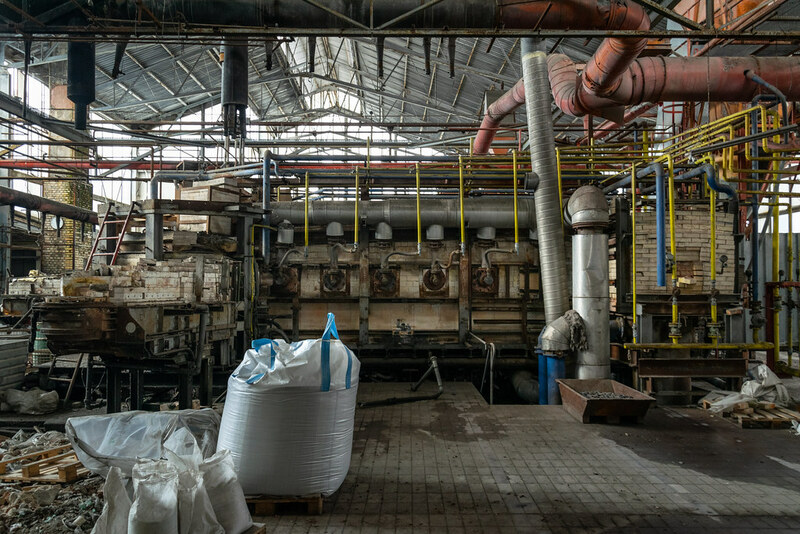 After an unsuccessful integration into another company in 1990, this glass factory had to declare bankruptcy in the following years. It was tried to sell the property at several auctions but there were simply no interested parties. Due to the massive contamination a comprehensive rehabilitation of the site would be simply too expensive. But that’s not the end of the story. Around the turn of the millennium multiple smaller companies were settling here. One of them was responsible for all those bags with the colorful stones in it we found everywhere in the main hall. This is glass granulate. We discovered superfine materials and also bigger, colored stones. They all were sold as decoration in the past. Next to the halls we found another real highlight: The former fabricant's villa. 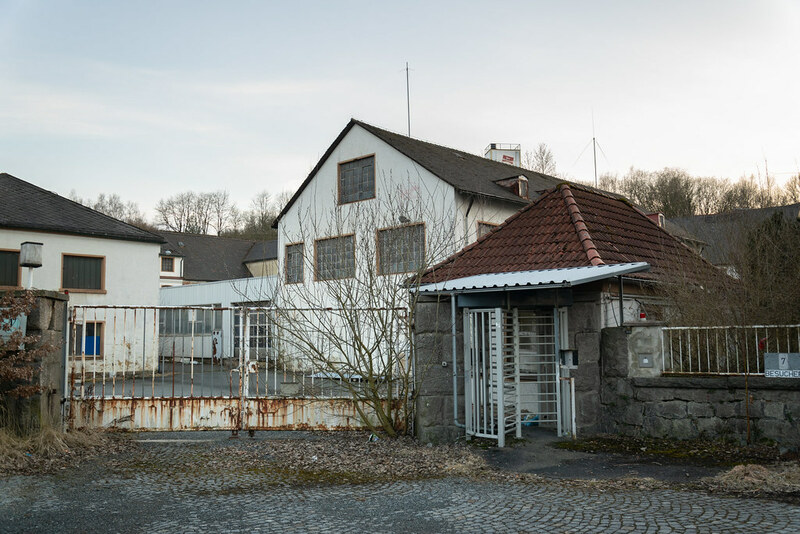 While the owner of the factory was living here in the past, later several offices were located in the house. 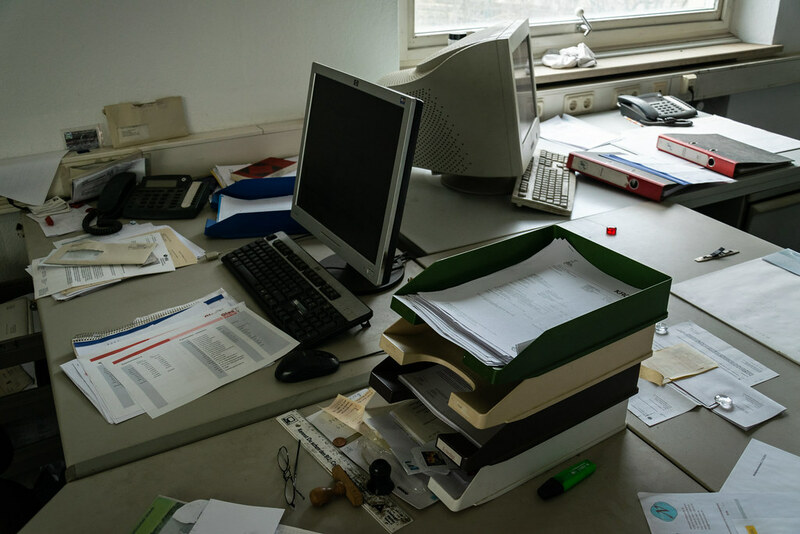 While all the archives were emptied out, the offices looked like the staff could come back at any moment. If you see the rooms, you could hardly imagine that this place is really abandoned. Everything seems to be broom-clean! In the documents we discovered dunning letters due to outstanding rents. The small companies which were settling here before weren’t able to come up with the immense leasing costs. That’s why the glass factory eventually became deserted only a few years ago. Today the glass craftsmanship is in a dying condition. Junior staff and buyers are both lacking. And so nothing more than cracked shards are left of this former traditional manufacturer. Amazing photos and loved the write up!! Quite different to your average german site. I'm gobsmacked. The second incredible report in the space of a week. Glass uses energy and energy costs have destroyed companies where I live. I expect the same would cripple a glass manufacturer given that they need so much heat. The site is pristine. I'd have been nervous in there - expecting someone to walk in. The images have left me quite speechless - who does the glass work now? Has it too gone to China? I was discussing the lack of recycling plants in the UK to a friend yesterday - recycled glass would be loaded onto ships and sent to Mainland Europe because nowhere could handle it here (North East England). I bet factories like the one in your report would be one of those which handled our used glass waste..